Today I have a new brand to talk about. 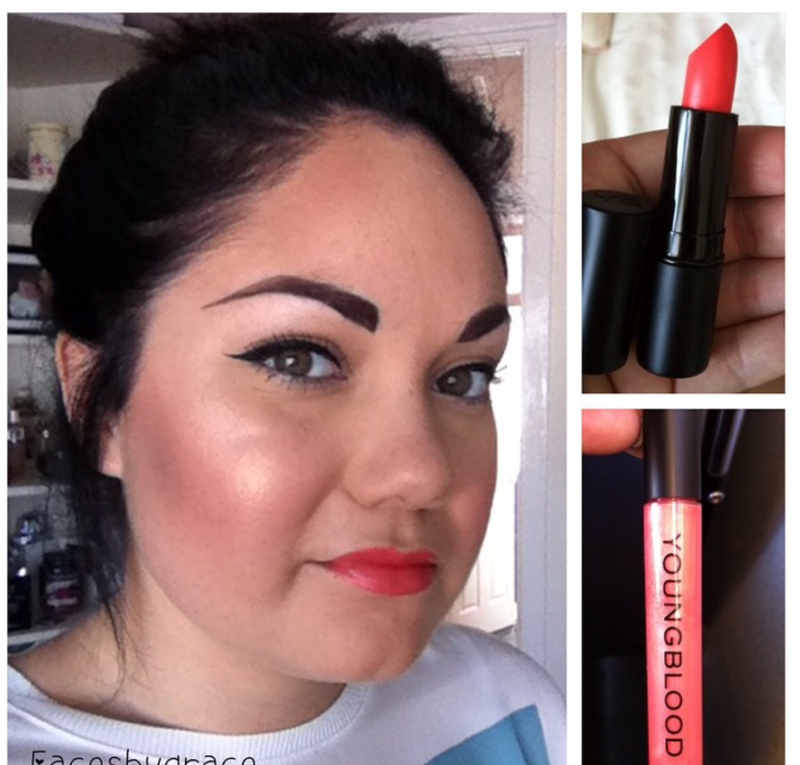 Young Blood mineral cosmetics recently sent me some products to try out. My first impressions of the brand is very good. The packaging is stylish and looks very expensive. I tried out the lipstick and lipgloss at work yesterday and loved them. I got heaps of compliments on my lips and everyone wanted to know what it was. Here is some background into the brand. Youngblood is the premier luxury mineral cosmetics line from the USA created by Pauline Youngblood, a former medical aesthetician. Pauline began formulating her first loose mineral foundation, which provided excellent coverage and a natural appearance without clogging the pores. The products are easy to use, long lasting and can stand up to heat, humidity and perspiration. Youngblood's lightweight foundations look virtually undetectable which providing flawless, buildable coverage. Youngblood mineral products use only the purest, most premium grade minerals. Their makeup is free of talc, parabens, oil and fragrance. 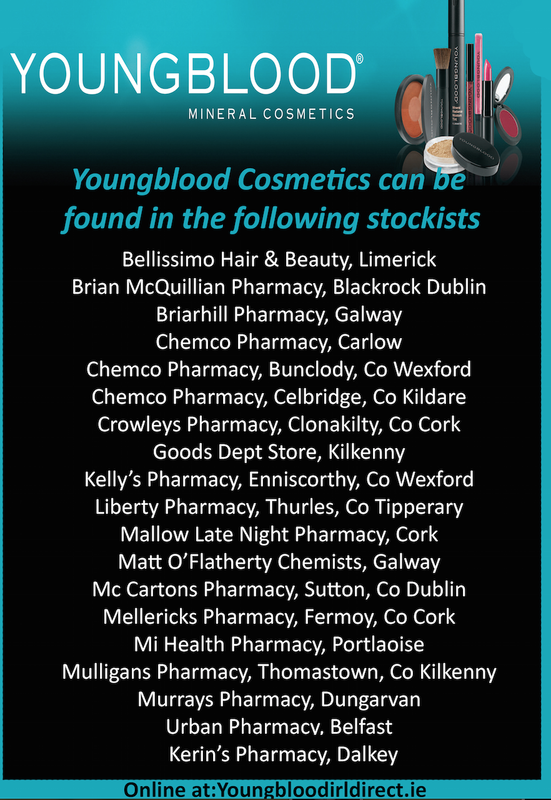 Youngblood mineral liquid foundation retails at €35.00. The deep sea hydrating complex quenches parched skin for a healthy radiance. A special blend of rare reduced salt deep sea water, botanicals and more than 20 ocean minerals soothes and revitslises skin and the pore free finish wears for hours! The Lunar dust retails at €29.00 and is a light - reflecting mineral highlighter that adds a sun-kissed finished. The pressed mineral rice powder retails at €33.00. this product controls shine and helps diminish the appearance of pores and fine lines to create a flawless, long-lasting matte finish. I love the compact it comes with. It is so handy for on the go with the great mirror included. I am loving this lipstick. It retails at €18.00. This lippie is lanolin free and includes a special blend of natural oils and vitamins and leaves the lips fresh looking for hours. This lipgloss is the perfect combination for the lipstick above. It retails at €19.00 and adds colour and shine all day long. the plumping shades provides noticeable results without tingling or irritation. They also contain natural oils and vitamins to condition and care for the lips. Here is where you can find Youngblood. I will have a tutorial soon using these products so keep an eye out for that.